Oh look! A new recipe! Well hallelujah and glory be. Is anyone else getting totally zonked by mercury in retrograde this month? If you’d asked me a week ago if I believed in this crock, I’d have told you to take your crock elsewhere, because I wasn’t buying it. But a batch of burned brownies, several stress-induced/bizarro dream-y sleepless nights, and not one but TWO clogged pipes later, the joke seems to be on me. At least I’ve got a handle on breakfast. 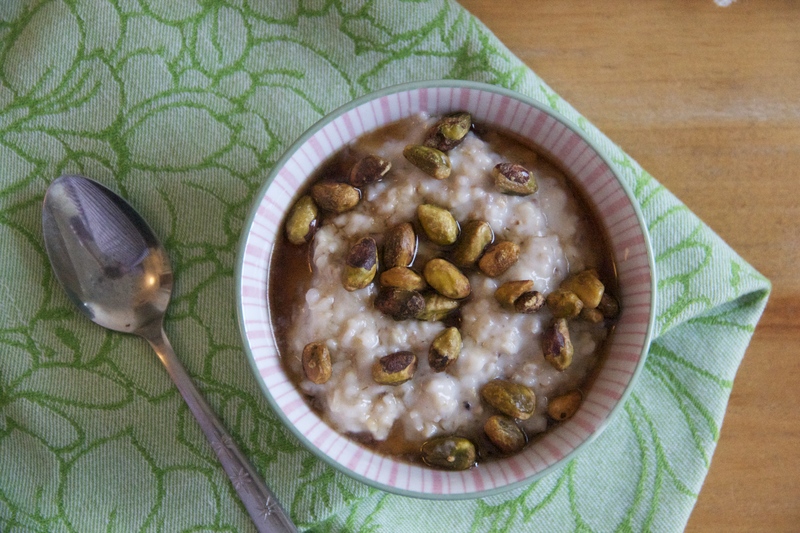 Did you know that oatmeal could be luscious? Because it can! These are steel cut oats, cooked gently in water and milk, with plenty of salt and just a touch of sugar. They’re beautifully simple, but simply perfect – warm, incredibly creamy, just slightly chewy, and doused with a healthy amount of maple syrup. Plus a scatter of roasted pistachios and yeah, okay, maybe a handful of (un-photographed) chocolate chips because IT’S BEEN A WEEK. Make these oats (or make a double batch!) this weekend, and eat breakfast like a goddess for days. Just store leftovers in the fridge, and scoop out a bowlful each morning to warm with some milk, or even a splash of cream. Because you deserve it! And mercury in retrograde can eat my oats. If you’re not into maple syrup (WHO ARE YOU?! …monster), feel free to swap out for a splash of honey or scoop of brown sugar instead. That’s the great thing about this breakfast! Fresh fruit? Splash of cream? It’s so easy to make your own. In a medium skillet, melt the butter over medium heat. Add the oats and stir gently to coat with the fat. Continue stirring until the oats are quite fragrant and nicely toasted, about 5 minutes. Set aside. In a medium saucepan, bring the water, milk, sugar and salt to a low simmer over medium heat. Stir in the toasted oats, bring the mixture to a slow boil, then decrease the heat to low and partially cover. Cook the oats, stirring occasionally to avoid sticking or clumping, until the porridge has thickened and the oats have softened, 25 to 30 minutes. Stir in the vanilla extract. Scoop the oats into serving bowls and top generously with maple syrup, nuts, dried or fresh fruit, as you like. Note: I like to make a single or double batch of oats, then store the cooled oatmeal in a tupperware in the fridge for about a week. Every morning, it’s so easy to scoop out some oats, warm them in a pan (or the microwave) with some extra milk or cream, and have a lovely, nutritious breakfast in just a few minutes. what kind of milk do you use? THANKS!